Why do you need a rotary cutter; it is easy on the wrists to use, the price is right, and readily available at my favorite place to shop. Scissors and knives is also a Quilt Product, that dates to ancient civilization but have been replaced by the round cutter which is a mere 30 or so years old. You will be amazed at how fast, easy and durable an Olfa Ergonomic cutting tool can be. We learn when studying the history of quilting both tools were instrumental for stitching with a needle and thread. In 1956 a young man working for a Japanese printing company noted the amount of downtime spent for sharpening razor blades and knife blades used to cut paper. What does the chocolate bar have in common with the cutting of fabric? Mr. Okada was intrigued by his snap apart, bite size, daily lunch treat. Yoskio Okada, found himself challenged to match the break apart design of his beloved chocolate bar. As an inventor, it occurred to him that maybe a blade could be made to snap off, exposing a sharp new cutting point just like his chocolate bar did. The OLFA Company which means “breaking a blade” was soon producing not only knives and blades but premium cutters for fabric too! 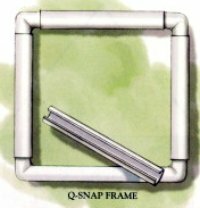 In 1979 quilters in other parts of the world fell in love with Mr. Okada’s OLFA cutter. It took the Japanese women a little longer to become enthralled but they soon got on board! This premium cutter is nothing more than a rolling razor blade. It looks like a pizza cutter with an egg-yolk yellow handle. The OLFA rotary blade is made of tungsten steel to keep the cutting edge durable and reliable. The best feature, for me, is the safety guide which I can operate with my thumb as I roll the blade against the ruler edge. I can cut several layers of fabric all at one time. The rotary blade requires two mandatory counter parts. 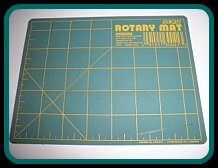 The first being a self-healing rotary cutting mat called the great table protector. The second is an acrylic ruler that provides a slight lip in which the cutter blade follows along the edge to produce a sharp, clean and straight cut. When first introduced to a rotary cutter it can be a bit scary…we don’t want you to get cut so read on. Every time you lay your cutter down on the mat or table and fail to close a cutter you owe me a fine of five bucks! This is important to learn. Never lay an open blade down on the cutting mat…it is dangerous. I didn’t say it can be dangerous…it is dangerous. And a sure way to get cut. In 1999 OLFA also came out with an ergonomic cutter shaped to fit the hand. While nothing can stop your arthritis, carpal tunnel syndrome, tendonitis or any repetitive stress conditions, the new design makes it easier on your hands and wrist. It is the only cutter for me! This model is also designed for both the lefties and those of us that are right handed which is another great feature. Click To Get Your hands On The OLFA Cutter! 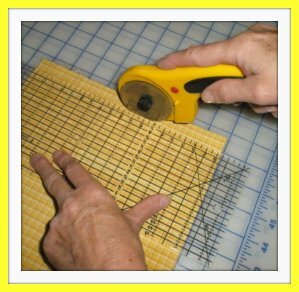 Place a drop of sewing machine oil on the edge of the acrylic ruler next to the blade. Immediately replace any blade that has developed a burr or nick. They are dangerous. Always push blade away from your body at a 45 degree angle. 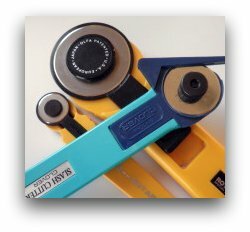 If you cannot stand up to use a rotary cutter, be sure you purchase the right cutter designed for a sitting down position. Pushing too hard will cause unnecessary stress and could damage your wrist. Make sure the blade is sharp. Test the cutter to find the optimum number of layers you can cut easily and accurately at one time. It is important not to cut too many layers at a time. I generally do not cut more than four layers of fabric at any one time and sometimes only three. Keep a handy first aid kit within reach in case of an emergency. Accidents will happen! Dispose of used blades by placing in the egg-yolk yellow plastic case after installing the new blade. Imagine reaching into your waste basket only to get bit by a snake that was not contained in the proper egg-yolk yellow plastic case! By the way, the same is true with disposing used needles. It is no fun getting stuck or cut so dispose worn out items the right way. There is a right way and a wrong way to reassemble a rotary cutter after replacing a new blade. Print the picture below and keep it in your three-hole binder of important “for your eyes only” papers. 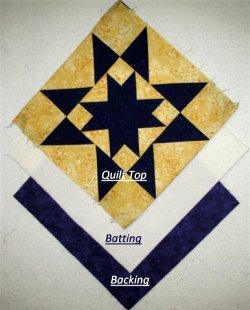 If you haven’t created this personalized quilt instruction book…do so! Periodically disassemble the rotary cutter to clean the lint from behind the blade. 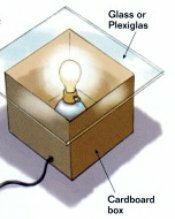 This extends the life of the blade. Want one? 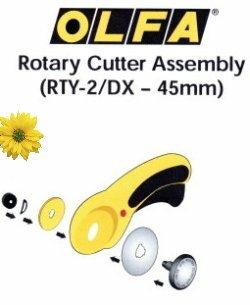 You can purchase your Olfa Ergonomic Rotary Cutter here.